"My work centers on the many facets of water: as a subject, a material, and an idea. 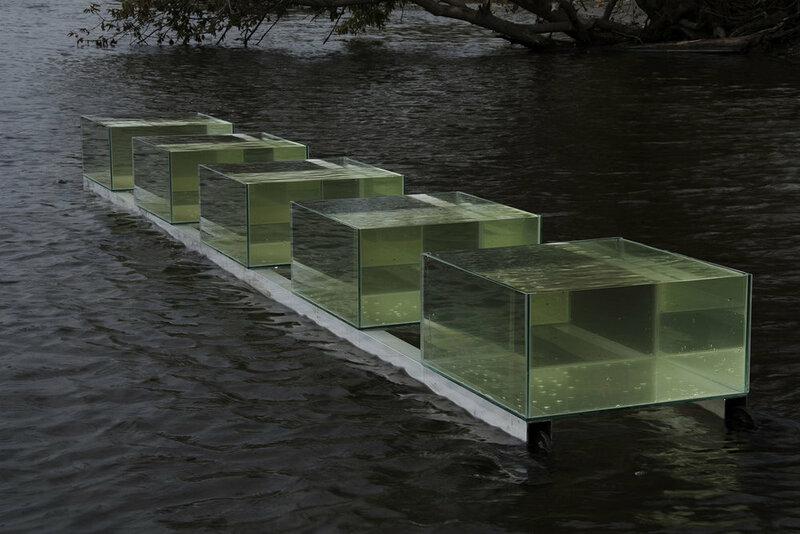 This series of site-relative installations, both holds and rests within water. I am looking for the ephemeral and perceptually mysterious." "In an ongoing series of environmental installations, I have placed water-filled glass tanks in various contexts: for instance, on a river where the tanks appear to be floating on the surface. Utilizing Snell’s law of refraction, the works challenge the relationship between perception and interpretation and how we interact with place. Part ritual, part experiment, part conceptual and aesthetic art action, the installations absorb and reconfigure both the surrounding imagery and the structure of the sculpture itself, creating visual phenomena that extend beyond the parameters of water and glass." "At it’s root, a topology is the study of “place”: geographical, geometrical, topographical, architectural, environmental, social, psychological, energetic. In anatomy, topology is used to describe the relationship between biological systems, such as muscles and nerves or tendons and bones. In mathematics a topology is concerned with how properties of space remain constant despite the continuous deforming of objects or sets: for instance, by twisting, stretching, and bending. Think of a mobius strip (a twisting object with only one edge and one surface), or a piece of elastic fabric held taut, and a tented shape generated by pushing a finger into its surface. What kind of space is created when we plunge a conical shape into a body of water? Two objects that share the same topological characteristics can be described as a homeomorphism: a function between two topological spaces that is continuous. Visualize an animated drawing of a doughnut morphing into a coffee cup and back again. Consider the relationship of water to wind and a wave. The “stillpoint” is the place between two moving objects that remains in constant proportional relationship to the two objects. It is a spatial point that does not move (in relativity). Imagine a point in the space between two ballroom dancers that move in mirrored unison; or the space between a birds wing and the air it moves; or the space between a boat lulling back and forth, and the body of water on which it floats. It is this point in [shifting] time and [deforming] space that interests me here. What is the relationship between the water and the air that moves it in a wave? Is there a space (metaphorical and/or physical) between the moving air and the water and does this place cease to move in the heart of its movement? Can there be a psychological “place” generated by understanding the inextricably intertwined connection between two or more (if not infinite) objects/systems/experiences? What is this? Again, consider the relationship of wind on a body of water creating surface waves. These shapes are a combining of a material (water), and a force (a flow of gases, in this case, air). The wave, which seems to be “of” the water, will not exist without its counterpart, the wind. It is like the male and female components of a casting mold, coalescing and merging, yet remaining separate. Can this indicate a quality of “presence” in the human condition?"